For years Syria has been torn asunder by war. The main driving force of this war now is intervention by imperialists and regional big powers. The US, France, NATO, Saudi Arabia, Israel, Turkey, Iran, and Russia – and many other states and interest groups – are either directly or indirectly involved in the war. To them, its all about power in the Middle East, and in the world in general, as well as resources and money. The Middle East is a hot-spot for the main contradictions in the world. This has been shown through 40 years of wars and conflicts, where all the world powers have been involved. We condemn the dirty role played by the Norwegian state in this war. Norwegian imperialism does not just participate as a running-dog for the US, but also plays it’s own independent part. Norwegian Jens Stoltenberg is the general secretary of NATO. Norwegian weapons are sold in great fashion to Turkey, Saudi Arabia and other active participants in the war. Norwegian soldiers serve as “military advisers” in the region. Big Norwegian companies are actively on the lookout for supplies and markets. Norwegian politicians place their support behind the NATO axis, alongside the US, United Kingdom, and France. This is not a reason for whitewashing the Assad-regime or Russia. They are not friends of the people. But one would be criminally forgetful if one doesn’t remember the role war propaganda played before the Gulf Wars, the bombing of Libya, or any other war of aggression throughout history. When Hitler invaded Poland, he did it on the pretense that Polish soldiers violated Germany’s territorial integrity. War-powers always manage to find excuses – be they true or false – to justify their brutal abuses. Saddam Hussein was a brutal despot. Our analysis of Assad is the same. Saddam Hussein gassed Kurdish villages. But the masses in Iraq, Arabs or Kurds, have not been liberated by the wars the US waged against Iraq. The war did however destabilize the region, and laid the foundation for ISIS and almost thirty years of war, instability, hunger and distress in Iraq. Interventions by Norway, NATO or the US are never about creating a better situation for the masses. It’s always about political or economic interests. No matter how the great powers justify it, fighting against imperialism is a duty. For Norwegians the struggle against imperialism applies particularly to Norwegian imperialism, NATO and the US, as it where we live, and it is this alliance Norwegian imperialism is a part of. 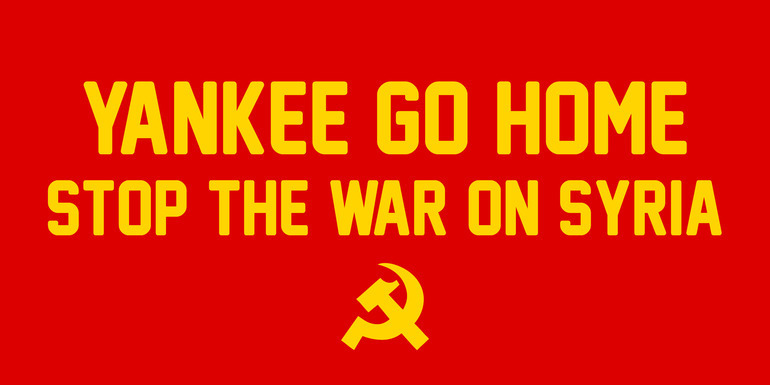 The wars can be stopped – but only by communism! As long as there is capitalist imperialism in the world, the wars will continue. However, imperialism is condemned to lose. It digs it’s own grave, just like the US keeps digging itself deeper and deeper in countries like Iraq and Afghanistan. This system is rotten to the core, and that’s why it will fall in the end, leaving us a world without wars. Join the Red First of May against imperialist wars, for socialist revolutions and new workers states!